Every piece of power distribution equipment and cabling HIPOWER offers combines innovation and excellence with enhanced features to provide superior power efficiency and versatility. Extensive experience providing power solutions on a global scale has enabled HiPower to master the complexities of power distribution technology. At every turn, they gather innovative ideas, identify premium components and make advanced engineering decisions to provide customers with best-in-class performance and durability under the most demanding conditions. The breadth of their offering makes them a one-stop resource for power distribution panels, boxes, cables and assemblies, all of which are compliant with or certified to the highest industry standards including UL, CSA, NEMA, NEC, OSHA, ASTM, MSHA, ROHS, ICEA and IEC, as applicable. 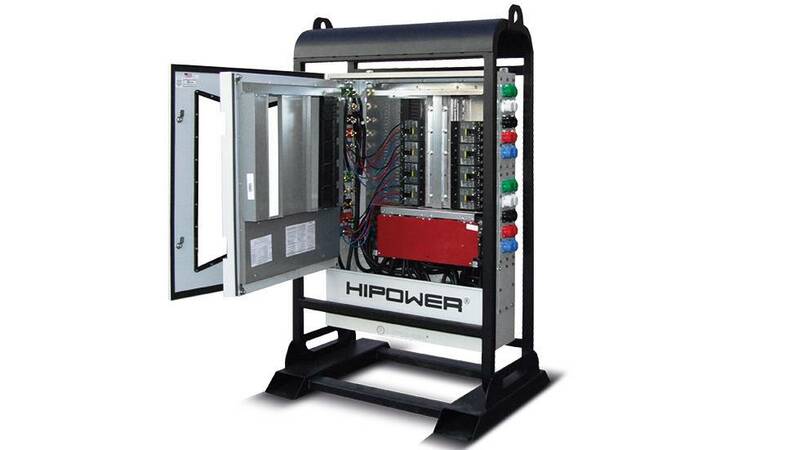 From alternative energy to petroleum and mining; aerospace and military to telecommunications and transit, HIPOWER SYSTEMS’ power distribution equipment offers unparalleled quality and ingenuity, around the clock. These UL1640 and CSA 22.14 listed panels range from 50-200A, including one of the industry’s only 10-position panels. Fully corrosion-resistant, the aluminum power panels can be custom-configured with a variety of breakers and connections. Most incorporate stainless steel cages that protect but do not interfere with ease of use. Other sizes available upon request. To learn more about the features and characteristics of the power distribution equipment, we invite you to visit the individual model pages below. Our portable, UL1640 and CSA 22.14 listed I-line panels solve many of the challenges facing power customers today. All feature corrosion-resistant aluminum enclosures and stainless steel or carbon steel protective cages. A versatile breaker engagement system is capable of feeding large or small motor loads, and panels accommodate breakers from 15-1200A, all of which can be safely removed, even under load. Other sizes available upon request. Whether you need to step-down, step-up or isolate an incoming power feed, our portable, NEMA 3R, dry-type transformers withstand the rigors of industrial environments. Available from 15-500Kva, they incorporate ruggedized, stainless steel protective cages and are delivered on a rolling dolly (15 Kva dolly-type) or forklift-ready, rolling skids (all other models). Other sizes available upon request. The boxes themselves are not mobile. Rather, they are stationary power distribution units hardwired into a facility’s power supply infrastructure. They offer the ultimate protection for operations where power is truly mission-critical―where the facility cannot be without power for even a few seconds, no matter what. These units enable companies to quickly and easily bring in replacements for backup generators so they can be taken down for service or maintenance, or to act as a “backup for the backup” in the event of a power outage. Since their introduction to the market, many companies are finding other, valuable uses for GDSs that go beyond the most mission-critical operations. Unlike transfer switches, which generally connect a permanent, external standby generator to a facility’s power connection for quick switching to generator power, a GDS is mounted on the building (or placed on a nearby pad) to create a “quick connect” link between the transfer switch or other disconnect and a mobile generator. If a facility wants or needs to obtain additional power for any reason, having a previously installed, externally mounted GDS enables them to connect a portable generator, located in a nearby alley or other external location, to the building’s disconnect via simple cam-style connections. Some of these units also can incorporate male or female cam-style connections, enabling either input of power to service the building or output of power for other uses. -Data centers concerned about the possibility of having their backup generator fail or be offline for service during a power outage that outlasts their UPS (uninterruptible power supply). -Hospitals and other facilities that maintain backup generators on a roof or in a basement, and for which laying hundreds of feet of cabling to connect an external generator would not be practical or wise. -Companies such as gas stations and convenience stores that in the event of a power outage wish to share one portable generator between multiple locations (for example, to pump all the gas from one store, then move on to the next). -Any facility that wants to the ability to use a portable generator without the delay of scheduling an electrician (assuming one is available) to hardware the generator to traditional switching gear. -Our research indicates that more than 90% of all new commercial and industrial buildings are being constructed with GDSs. Now, given the increasing frequency of power disruptions from grid fluctuations and extreme weather events, many companies with existing facilities are installing them as a failsafe, as well.